Data Measurement is undergoing a massive period of disruption driven by changes in media platforms and consumer behavior, as well as an increasing plethora of data. Data collection is now inherent in everything we do – the media we watch, the products we buy, what ads we pay attention to and how we spend our time. Data is everywhere. The challenge is, which data to use and how to analyze it? Additionally, who is in control of how the data gets used? That’s another big question. Finally, marketers are increasingly moving away from traditional “channel based” marketing efforts toward more “consumer/audience based” ones. This movement also creates new data related opportunities and challenges. 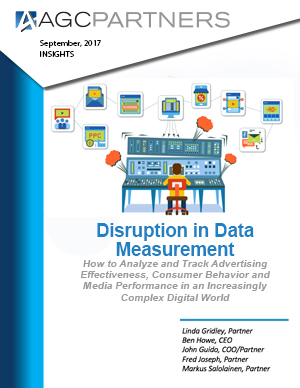 The report identifies up and coming data measurement tools, technologies, and companies and helps to explain the underlying trends causing the disruption in the Data Measurement industry.